Is your website performing on Mobile? Is Your Website Performing Well on Mobile? The general consensus in Digital Marketing is that you need either a mobile version of your website or a responsive design in order to offer the best user experience possible to smartphone users. User experience is often an ongoing process though, as trends change, so it is worth while checking whether your website performs well on mobile on a regular basis. Although there is value in simply looking at your site on a smartphone, this isn’t the only way to check. You can and should regularly look at your Google Analytics data to see whether your users are finding it easy to use and are converting. Before we start, it is important you track any conversions through Analytics, so either set up goals (these are good for non-purchase conversions like inquiries and signups) or eCommerce tracking. You can find these by opening the Conversions section of Analytics. First it is worth seeing how your website performs as a whole on mobile, tablet and desktop. To do this, go to Audience -> Mobile -> Overview. Bounce Rate: If you see a higher bounce rate on mobile than tablet and desktop, it potentially could mean that your mobile website isn’t performing quite as well. However, in the case of an eCommerce website, this could quite easily be due to trends still. We are more and more moving towards mobile commerce, but many still prefer to buy on desktop. If, however, there is a big difference in bounce rates, then a review of your mobile website user experience is needed. Time on Site: Generally we spend less time looking at each website on mobile, due to the nature of the device. However, it is worth checking how long your users are spending on-site to make sure they aren’t leaving too quickly. eCommerce Conversion Rate / Goal Conversion Rate: This is the key one. Are people converting on the mobile version of your website? As mentioned above, differences could be due to trends, but again, it may signal that you should look at your mobile user experience. If you are targeting advertising, it could also mean that you should target desktop over mobile. As well as looking at the website as a whole, you can drill down to each individual page to see if it is performing well on mobile or tablet. To do this, first go to Behaviour -> Site content -> All Pages. Here you can select a page by clicking on it. It may be good to select one of the pages with a low value, or a high bounce rate. Once you have chosen your page, click ‘secondary dimension’ and choose Device Category. You will now be able to see the performance of that page on each device. It is worth noting, once more, the time on page as well as the bounce rate to see whether your users are staying or leaving. It is also worth noting the page value, which takes information on the amount of sales and the part played in them by this page. 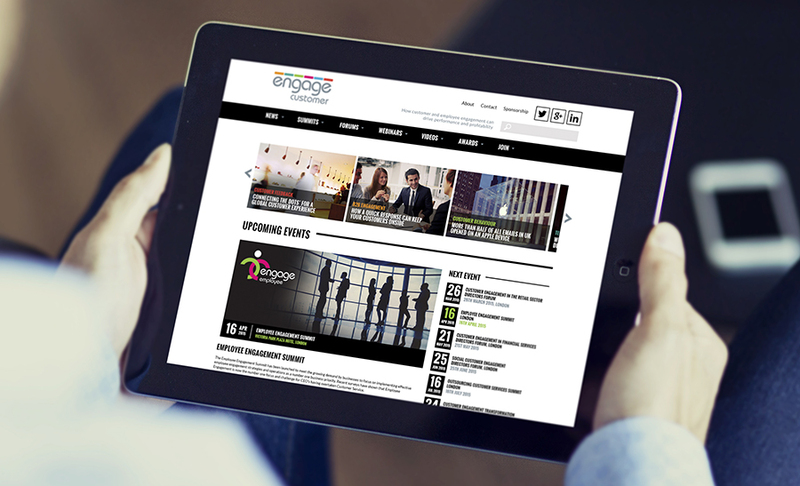 Here at b:web we have worked with many different types of businesses, creating mobile optimised, responsive websites. One example is Engage Customer, which provides information, conferences and guides to increasing customer engagement. 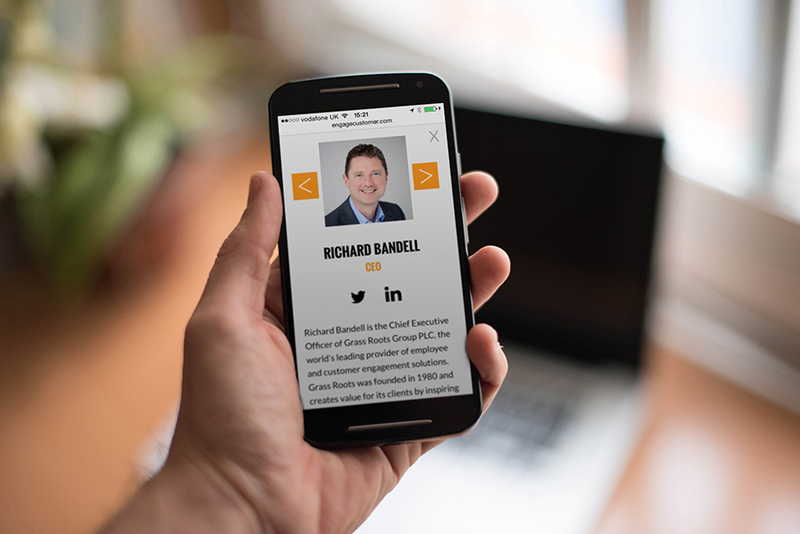 The and tablet user experience is hugely important for Engage Customer so we designed and built a website that looks great and performs well on both mobile and tablet. Above you can see the Engage Customer website, as displayed on a tablet.